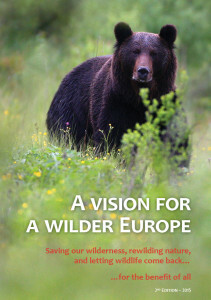 Eleven organisations from across Europe reconfirmed their ambition to make Europe a wilder place by signing the new edition of the “Vision for a Wilder Europe” in March 2015, which is just published. 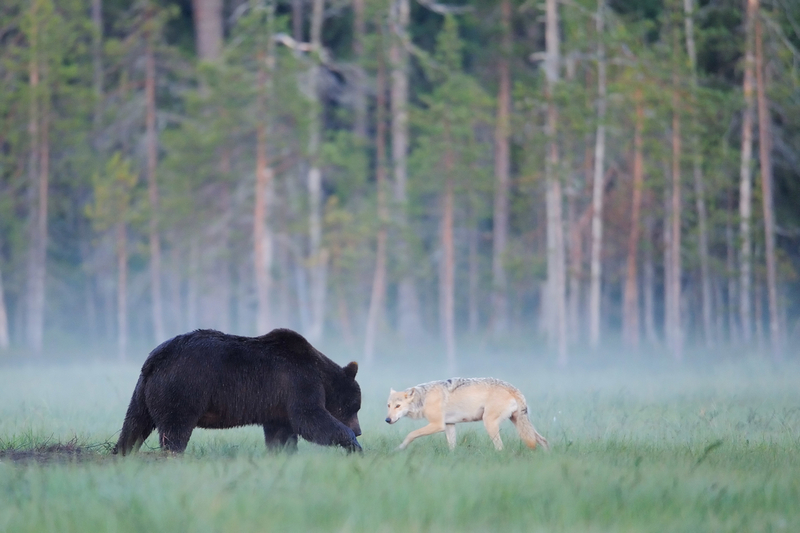 European wolf interacting with European brown bear in Kuhmo, Finland. The goal of the ‘Vision for a Wilder Europe’ is ‘to build on the significant conservation achievements in Europe over the past decades and to launch and promote a new paradigm in management and view of wild nature in European conservation’. It was first launched in 2013 at Wild10, the World Wilderness Congress in Salamanca, Spain, where nine environmental leaders signed the document and presented it to senior representatives from the Council of Europe and the European Commission. Two new organisations have now joined the signatories of the vision: Rewilding Britain and the European Wilderness Society. – “In the 15 months since WILD10 convened in Salamanca, the re-emergence of wild nature across Europe’s lands and seas has continued and accelerated,” says Vance Martin, Co-chair of Wild10 and President of the Wild Foundation. “But the threats continue apace. The opportunity remains ripe to show how wild nature and human society can reach a new and mutually beneficial relationship in the world’s most densely populated continent. We need to act NOW, because this window will not remain open for long”. Rewilding Europe, Wildlands Research Institute, John Muir Trust, Zoological Society of London, Frankfurt Zoological Society, European Wilderness Society, Fundació Catalunya- La Pedrera, Rewilding Britain, Wilderness Foundation, Deutsche Umwelthilfe and Wild Wonders of Europe have worked for over a year on this vision. The organisations put emphasis on recognizing, restoring and allowing natural processes, which ultimately could create more robust ecosystems and more cost-effective conservation management systems, reduce the loss of biodiversity across the continent, provide scientific knowledge about natural developments without human interventions, give more people a closer relationship with nature in contrast to our highly technological worlds, increase resilience to the effects of climate change, and generate new economic opportunities and better services for society. Leadership& strategy: promote the new conservation vision vis-à-vis key constituencies and develop an action-oriented strategy. Download the Vision by clicking on its cover page.